Bellowhead release a Christmas single on 1st December. It's what used to be called a Double A side back in the days of vinyl, with the two songs being "Christmas bells" and "Jingle bells". "Christmas bells" is a song based on the traditional Mummers play "Christmas: his pageant play, or Mysterie of St George", and was written down and published in 1842. 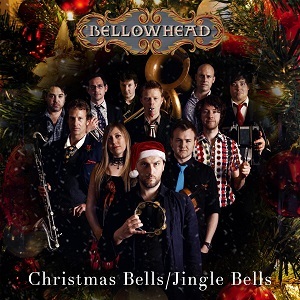 Hearing a Christmas song performed by Bellowhead with their folk sound is very refreshing and very enjoyable. "Jingle Bells" scarcely needs any introduction being so well known, although few people realise it was originally written for Thanksgiving not Christmas, back in 1850. I must admit I did wonder how they'd choose to do this song - would they go for a straight version or would they try and give it a different feel. Well the answer is a bit of both actually. The chorus remains the well known fast paced one, but during the verses they've managed to give it a different feel - it's their folk sound but with the lyrics unchanged. The result is far more enjoyable than I could have hoped for when I initially saw they were covering this song. This release is a nice change from the Christmas songs that we're used to hearing every year, as lets face it we tend to hear the same doen or so songs played to death every year, so Christmas songs do tend to get a bad name simply from over-playing. As such its refreshing to hear a different song and also to hear a quite different version of a song we're all used to. I initially found it hard to find the enthusiasm to give this single a listen, especially with Christmas still a month away, but I'm really glad I've finally listened to it as it really is a great release. Definitely recommended for Christmas listening. The single will be released on 1st December 2013 on Navigator records.